At Consol Energy’s Harvey mine, about an hour south of Pittsburgh, Craig Williams takes a mid-day break above ground, in a big room at the mine’s entrance. He’s in his work gear: dusty jacket, hardhat with headlamp, and safety glasses. Though times have been tough in the coal industry, Williams and other miners here have managed to keep their jobs. He hopes to hang onto his job as a foreman. “Pittsburgh used to be big on steel. That’s mostly gone — we’re one of the last industries around and hope to keep it that way,” Williams says. A father of two, he says, like generations before him, coal is the best way he’s able to support his family. He wouldn’t say what he’s making, but nationwide, coal miners make around $80,000 a year. “If you had to take another job, in this area especially, you’re going to take anywhere from a 50 to 70 percent pay cut to the next best thing that’s out there,” Williams says. But 40 percent of coal mining jobs have disappeared since 2011, and now only about 50,000 of these jobs remain, according to the Bureau of Labor Statistics. Experts say automation, lower demand for electricity, and above all, competition from cheaper fuels are what’s killing the industry. Those fuel sources include natural gas from fracking and increasingly, renewable energy. Solar power now accounts for just under 1 and a half percent of electricity in the U.S. But according to the Department of Energy, solar jobs now outnumber those in coal by more than 2 to 1. Jobs involving solar totaled 373,000 in 2016, according to the report, while employment in coal, including coal-fired power plant workers, totaled just 160,000. So can laid off coal miners find jobs in solar? “It’s a possibility but there are a couple of major challenges,” said Rod Godby, an energy economist at the University of Wyoming. One of those challenges is simple: location. Coal mining is concentrated in a handful of places, while solar is far more widespread. “When you are thinking about coal mining in Appalachia I mean often times there are generations of families in those regions and it’s just very difficult to pick up and move,” Godby said. Coal miners make on average around $35 an hour, Godby says, in part because the job can be dangerous. In renewables its more like $20 or $25 an hour. “That doesn’t mean you couldn’t raise a family on that but you’re a lot closer to the average income in a lot of states in the solar industry than you are in mining industries,” Godby said. Wylie Koontz is an example of someone who made the switch from coal to solar. Koontz, 23, worked at Consol Energy’s Enlow Fork mine, near Pittsburgh, making $15 an hour as a contractor working on belt maintenance. When he got laid off last year, he saw a job opening with Energy Independent Solutions, a local solar company. “I didn’t like — mentally (think) I’m going to completely switch. It was a coincidence I just found this job it was about the same pay rate that I was making before so I just went for it, and ended up really likin’ it,” Koontz said. 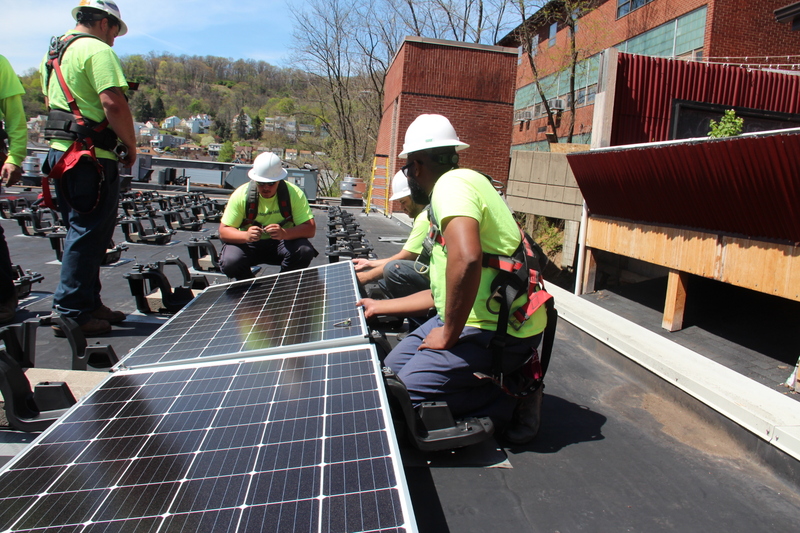 On a recent afternoon, Koontz was with a team of other solar installers putting solar panels on a community center in Millvale, just outside of Pittsburgh. Koontz says he likes the problem solving he has to do as a solar installer — figuring out the best place to put solar panels on a roof, or the most efficient layout to run a ‘string’ of panels. One thing that did not weigh on his decision was climate change. “I don’t believe in the whole climate change thing….it’s good, it takes the carbon (out of the atmosphere)…it’s a lot cleaner energy” but it’s a steady paycheck, not the environment, that drew Koontz to the job, he says. 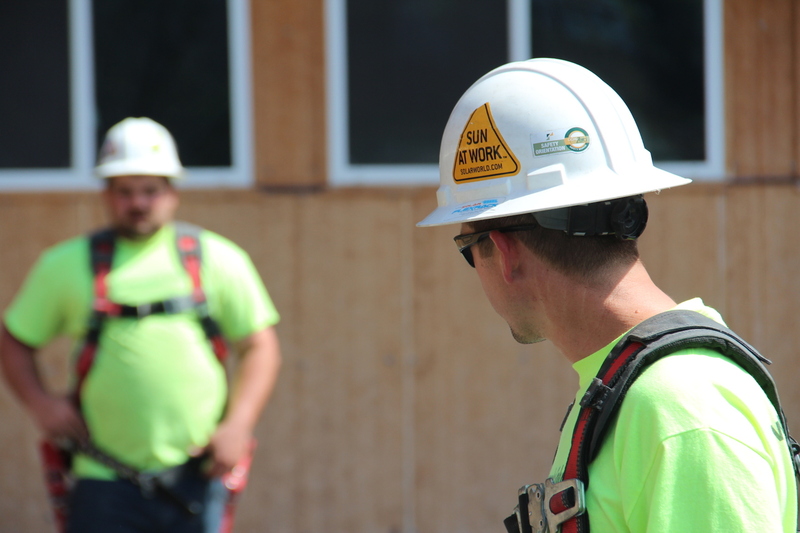 Brian Krenzelak was a roofer before joining the company seven and a half years ago. Krenzelak installs solar and trains others, and he believes in the mission of green energy. Krenzelak’s wife also works as an attorney, and the couple have three kids, one in college, with another about to enter. They even have a second home in Florida. “I do well with this company. It covers what we need to cover…I’m not becoming a millionaire overnight but steadily have been building a nest egg for sure,” he says. He’s had several co-workers who have raised families on what they’ve made installing solar. Krenzelak likes the idea that solar is up-and-coming. He says when his crew went on a big installation recently, other contractors asked them about what they do. Experts say solar’s surge is being helped by incentives that are scheduled to run out in a few years, and they don’t know how long the boom will last. Solar City, the nation’s largest solar company, reported lower installations so far this year. But solar jobs in Pennsylvania grew last year by almost a quarter. And Krenzelak’s company, at least, is busy. It’s looking to basically double its workforce of 22 over the next year and a half.